I have 2 Arduino Teensy 3.2 boards that I'm trying to implement serial communication between the 2 boards. I have successfully done this by connecting RX1 of the 1st Teensy with TX1 of 2nd Teensy and TX1 of 1st to RX1 2nd. However I was wondering if I could send serial messages between the Teensys i.e. do the same thing, by connect the 2 Teensys via the USB port? Or is this USB port reserved to connecting the Teensy to a computer? Note: The Teensy you pictured is an ARM based (NXP MK20DX256) Arduino which is very different from well established legacy Arduinos. There have been (and, maybe, still are) "bugs" in some ARM Arduino code. So Teensy pins used outside their normal (expected) purpose my or may not work like similar pins on legacy Arduino platforms. In order for 2 USBs to talk to each other, one needs to be a USB Host and the other a USB Device. There can be multiple USB Devices so the USB protocol is made more complex to handle this feature. There can be many types of USB Devices each with their own underlying protocol so the USB protocol is made more complex to handle this additional feature. A serial port USB Device uses the CDC or Communications Device Class protocol. So, in order to have two Teensy board to talk to one another using the USB CDC protocol, one of the Teensy boards needs to be turned from a USB Device to a USB Host. Which is not trivial. Most developers will turn to the OEM of the processor. As most processor OEMs offer free software for such purposes to promote the sales of their hardware. Not the answer you're looking for? 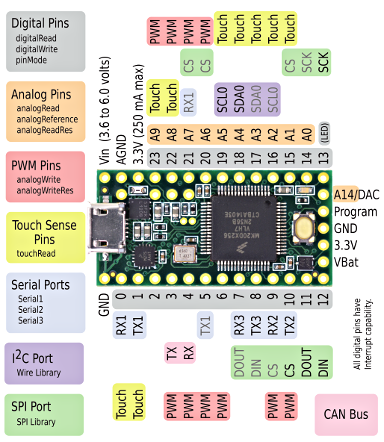 Browse other questions tagged serial usb teensy or ask your own question. How reliable is Arduino Uno Serial, via USB (ATmega16U2), CRC needed?